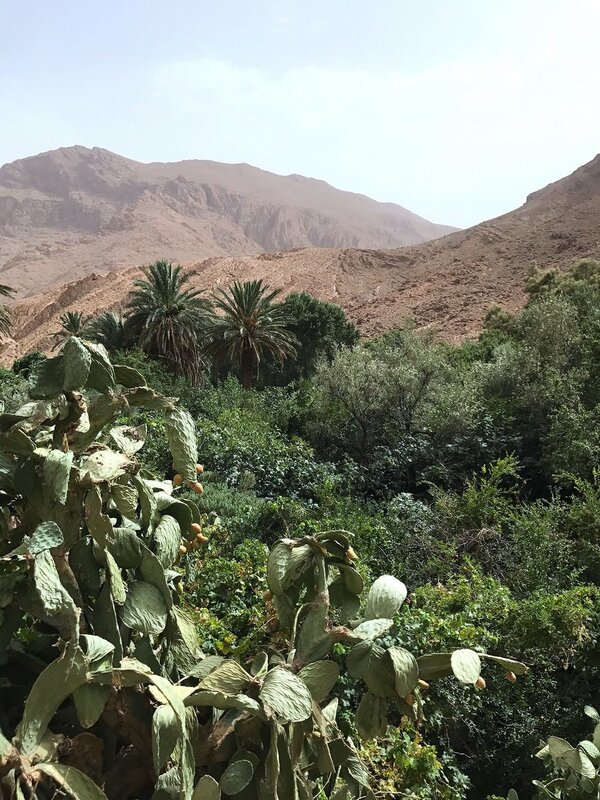 How Todra Gorge Will Change Your Perception of Morocco — Sapphire & Elm Travel Co.
Once you hike in the magnificent palm groves and meet the friendly Berber villagers of Todra Gorge... Morocco will never be the same for you. Close your eyes and picture Morocco. What are the first few images that appear in your mind? Chances are some combination of the Sahara Desert, mud homes, mosques, colorful lanterns and textiles popped into your imagination. This is exactly what I thought Morocco was going to be - brown and hot, with beautiful handicrafts. While this is all very true, Morocco is brown and hot, the Sahara Desert is tremendous, and there are so many beautiful handicrafts like textiles, rugs, lanterns, and leather goods, however, Morocco is also so much more than this, more than what I expected. Firstly, Chefchaouen was more beautiful, charming and blue than I could have hoped for! Then, I had the most astonishing day canyoneering at Akchour. I had absolutely no idea this lush river was here, and so close to Chefchaouen! If you've never heard of Akchour, you're definitely not alone, but you should really check it out! After a few days in the city of Fez doing quintessential Moroccan city activities, I went into the Sahara Desert. I was thrilled to get to experience the largest desert in the world, draped across the entire width of the continent of Africa! It was almost incomprehensible what I witnessed. The Sahara Desert was really a surreal and expansive place; rippling sand as far at the eye could see, wind-sculpted dunes, and 1.5 hours on camel back felt like much, much more. Probably the most uncomfortable thing I’ve ever ridden, or even sat upon! Yes, I did ride a camel in the Sahara Desert in August, like a crazy person! It actually wasn't as hot as I thought it was going to be. But Todra Gorge was really the place that changed my perception of Morocco. So why Todra Gorge? Draa Valley and Todra Gorge are widely considered the two most beautiful places in the Sahara Desert in Morocco. Due to time constraints, I had to choose between Todra Gorge and Aït Benhaddou, a UNESCO World Heritage site made famous in movies like Gladiator, Babel, The Mummy, Prince of Persia, and many more. Clearly, I was slightly saddened that I had to choose between the two. In the end, after consulting with many locals and other travelers, my friend and I decided to head to Todra Gorge, so we hopped on a bus and headed to Tinghir. Todra Gorge is located in the eastern part of the Atlas Mountains, where the Todra River and the Dades River have carved out a narrow canyon called Todra Gorge (sometimes spelled Todgha Gorge). After we arrived into the tiny, non-touristy town of Tinghir, checked into the hotel, settled a bit, then we headed out to where the gorge started. We were instructed to take a taxi to Todra Gorge, and that it would only take about 15 minutes by car. Where we were dropped off between the canyons, there were several vendors and restaurants selling everything from water and snacks to Berber rugs. From there, our initial plan was to hike the 14 km (8.5 miles) through Todra Gorge canyon back to Tinghir. It was only mid-day, so we believed we had the 3-4 hours necessary to walk back. We started walking in the direction of town, following the river through the massive cliffs surrounding us, rock walls at times over 500 feel high, a traditional Berber village tucked in a palmeraie just before us. We crossed the river ducking between trees and bushes to find the slightest hint of a path. Amazed at the thick foliage here in Morocco, a place that's supposed to be dry and barren, that seemed to obstruct our course, reminding us that not all blockades are problems to overcome but experiences, journeys to be had. At point when we really couldn't find said path, we were invited into the home of a family who helped show us the way to drink mint tea with them. After tea, we ate our picnic lunch beneath a collection of large trees next to the river, a few local children came up to us to chat in admirable broken English and to offer us fruit. We frolicked in the tall grass, playfully jumping from patches of dry land to patches of dry land. It was a perfect afternoon spent traversing river terrain... in Morocco... in August. Wait, what….? Did I really just say that? Hiking in the afternoon sun? In the Moroccan desert? In August?! This is something I certainly did NOT expect to do on this trip to Morocco! It seemed as if Morocco was full of surprises, this country has so much more than desert, mosques and souks like I expected. Several times throughout our walk, locals would come over to us and chat. They’d ask where we were going and point us in the right direction. Often times the path was unidentifiable, and locals would show us the best course of action. Other times they were offering us fruit. In fact, we were offered different fruit by three different groups of people. The people were so very kind and generous! It seemed as if everyone we passed took an interest to ensure we were safe and cared for. After roughly an hour we quickly realized that walking all the way back to town was not going to happen. But the walk was so lovely that we decided to continue on as long as we could before it got dark and then we’d get back on the road and hail a taxi to Tinghir. We passed lush fields with palm trees all around and crossed the river using stones to get across dryly. We passed people cultivating their land, washing their figs or refilling large jugs in the river. Todra Gorge is a breathtaking, tranquil, flat and a surprising lush hike. Life was happening here; life beyond the barren sand dunes of the Sahara Desert, beyond the souks in Marrakesh. And we were the only two tourists around. Proving that there are numerous places in Morocco to visit, yet it’s still pretty untraversed. It truly was a magical afternoon. While I still wish I could have seen Aït Benhaddou (and so many other places in Morocco I'll have to go back for), I am grateful for having selected this path. For it was Todra Gorge that solidified Morocco as a diverse, abundant, and friendly place in my mind. Next: You Won't Believe This Lush Canyoneering is in Morocco! Do you want to experience the variety Morocco has to offer? Contact us to plan your one-of-a-kind trip to Morocco.